I have been told that tai chi can be done on three levels: up high and lightly for stress relief, down low working the muscles for health, and in the middle for combat. But as I was drawing a diagram for my students, it didn’t seem complete. 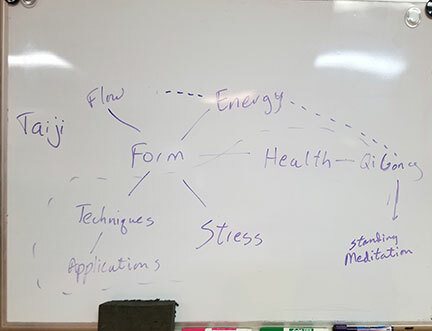 The more I looked at it the more it seemed that it should go like this: on one level I can do the forms to just reduce stress, on another level I can do the forms and unpack the techniques and applications, and I can do it for health (but there is more to health than just exercising the body and range of motion, it includes qi gong as well, which appears to be linked to energy), another level I can do it for is the flow (that awesome flowy feeling when all the moves are one continuous motion and energy feels like a shadow following the flow), and finally when you do the form feeling like your moving through water and/or stuff in the air and specifically to connect to energy and your own energy just spikes. I wanted to see if the extra dimensions track with your experiences. Congratulations! You have a lot of information coming at you. This is just from my own experience, but also from colleagues, many of whom I have discussed this with. You�re definitely on the right track, as I understand it, but I would like to add another idea predicated on the pivotal point of Yi (?-intention). Of course, leaping from meditation into application is not easy, but in internal practice, it is only the ability to do that that counts, and that should be a constant state during the practice of the form. I have one more thing to add: we often teach our students, especially beginners, in discrete levels. But in my opiinion it is crucial that we always remember that the final state is not at all segmented. It may take a while for them to get to that point, but it does a disservice if we do not remember it ourselves. NOTE: We’ve been investigating a glitch in our “comments” section. Until it is fixed please leave your comments on the form below. They are important to us. By clicking this box you are agreeing that we may contact you with regards to your request. Posted November 23, 2018 by Ted Mancuso. Comments and trackbacks are open. Follow the comments feed.